For those who smoke their first cigarette within 30 minutes of waking up. Relieves cravings and helps you overcome the urge to smoke. Keeps working, even after the lozenge is gone. 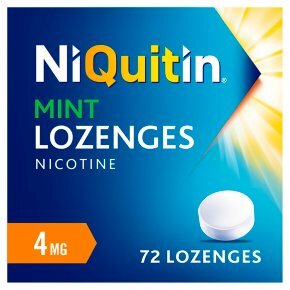 NiQuitin Mint 4mg lozenges are ideal for helping to reduce withdrawal symptoms including the irritability, frustration and anger many feel in the first few weeks of a quit attempt. NiQuitin Mint 4mg Lozenges are part of a programme designed to support your wish to stop smoking. Using lozenges at regular intervals gives your body the nicotine you need to help you stop smoking. For full instructions please read the enclosed leaflet carefully. How to Use For oral use. The lozenge is designed to be dissolved in the mouth; normally this takes about 30 minutes. Read the package leaflet before use. These lozenges are for smokers who smoke their first cigarette less than 30 minutes after waking up. NiQuitin Mint Lozenges can help you to stop smoking straight away. Adults (aged 18 years and over): The recommended treatment schedule is: Step 1 (Weeks 1 to 6): Initial treatment period 1 lozenge every 1 to 2 hours Step 2 (Weeks 7 to 9): Step down treatment period 1 lozenge every 2 to 4 hours Step 3 (Weeks 10 to 12): Step down treatment period 1 lozenge every 4 to 8 hours During weeks 1-6 it is recommended that you take at least 9 lozenges per day. The lozenge should be allowed to dissolve. Do Not chew or swallow whole. NiQuitin Mint Lozenges are Not for use in Children under 12 years of age<br>WARNING: Do not exceed the stated dose. Do not exceed 15 lozenges per day.<br><br>DO NOT USE THIS MEDICINE IF YOU:<br>Are allergic to nicotine or any of the other ingredients<br>Suffer from phenylketonuria (the lozenges contain a source of phenylalanine, which may be harmful to you)<br>Are a non-smoker<br>Are under 12 years of age<br>Have recently suffered from a heart attack, severe heart rhythm disturbances or a stroke<br>Have unstable or worsening angina or Prinzmetals angina.<br><br>SEEK MEDICAL ADVICE BEFORE TAKING THIS MEDICINE IF YOU:<br>Are under the care of your doctor or are receiving a prescribed medicine<br>Are diabetic<br>Are pregnant, talk to your doctor, pharmacist or nurse before using this product<br>Need any advice before starting to use this product, talk to your doctor, pharmacist or nurse.<br><br>You are more likely to quit smoking when using this product with help from your pharmacist, doctor, a trained counsellor, or a support programme.<br><br>KEEP OUT OF THE SIGHT AND REACH OF CHILDREN.